For our March blog installment of our Acupuncture and Chiropractic series, we will be sharing a recent case involving acupuncture and chiropractic evaluation of a performance horse that was done in complement to a “traditional” exam. This case is particularly helpful to point out how a holistic approach to treatment was able to bring this horse back to full function, when a purely acupuncture, chiropractic, or traditional approach alone would all have failed. “Holistic”, while often thought of in relation to hippies and natural products, in reality only means “Whole” (or understanding the parts of something as intimately interconnected, and explainable only by referencing the whole). In this case, the whole of the horse was examined and the horse was treated in a way that not only addressed his manifesting symptoms, but also the underlying problems causing the symptoms. Restriction: an area of abnormally tightened muscles and ligaments (sometimes this is referred to as being “out” in an area). The idea being that abnormal contraction of soft tissues will make the area feel slightly crooked or shifted from the normal position. This is often not apparent to the untrained eye. 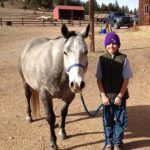 It is the time of year here in Colorado when we start training our horses to prepare them for the spring and summer show schedule. In conjunction with the start of training, we also want to make sure that they are comfortable and in good physical shape to perform maximally and, as much as is possible, to prevent injury. The examination performed prior to acupuncture and chiropractic treatment is designed to specifically identify areas of pain and/or muscle tightness, and it’s a great complement to the pre-performance dental and lameness exam that we here at MVS recommend on a 6 month basis for horses in regular work. While a lameness exam is primarily an evaluation of the joint motion of the limbs, the pre acupuncture/chiropractic exam is a more thorough assessment of the muscles and tendons (soft tissues). The goal of chiropractic and acupuncture is to remove restriction from painful muscles and ligaments so that all the joints can move freely and normally. Often, horses with joint pain in a limb have compensational muscle pain in their back and even primary spine pain, just like people. Restoring normal motion to all the joints prevents destruction of, and grinding between, cartilage and bone; thus, delaying arthritis. 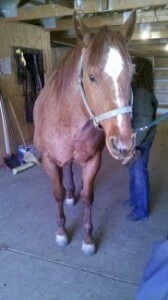 History: Trapper is a 13 year old Quarter Horse gelding that is regularly used for western lessons and trail riding. He is a willing horse that likes to please, and his owner describes him as honest. Trapper will rarely refuse to do work unless something is painful. Trappers’ owner had noticed that over time the horse had become progressively less willing to work at the canter – particularly the right lead. He had also become girthy and began objecting to being brushed, something that was unusual for him. Acupuncture Exam: This exam showed that Trapper had sensitivity over his withers and in areas along his back that often correlate to multiple causes, including rear limb lameness, back pain, and stomach ulcers. Lameness Exam (note: this was scheduled as a regular veterinary service and is not part of a regular chiropractic/acupuncture evaluation): Trapper had a limited ability to flex his left stifle. His teeth were also checked at this time and were fine. Treatment: Trapper was adjusted chiropractically to restore movement in his lower spine and withers. Many of his trigger points were eliminated with this adjustment. His painful areas were then also treated with acupuncture to help in sustaining his new ligament and muscle relaxation, thus allowing for the adjustment to restore normal spine movement for a longer amount of time. 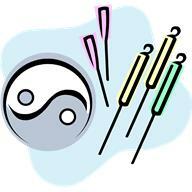 Acupuncture is helpful in facilitating the effects of the chiropractic adjustment, and can sustain the adjustment despite some light work in some cases. After two treatments, Trapper was about 70% improved but he still showed signs of pain in the acupuncture points and trigger points related to stomach ulcers. He was then treated with the conventional treatment for ulcers, while his joint pain was treated with regular Adequan and joint injections as needed (rarely). He has made a full recovery. Summary: In Trapper’s case, stomach ulcers and stifle arthritis both contributed to abnormal carriage of his spine. He also had evidence of some spinal arthritis, indicating that this posture may have been present for some time. Trapper had a great deal of pain in his spine that had to be addressed initially in order to be able to define the underlying causes of ulcers and stifle arthritis. If the ulcers had been treated alone, Trapper would still have pain and active compensation happening in his spine, furthering his arthritis and poor performance. Likewise, if the ulcers had been left untreated, this would not have resolved at all due to gastrointestinal pain. 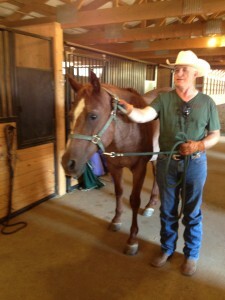 He required all of the above (treatment for the pain, abnormal locomotion, and ulcers) to become a normal horse again. 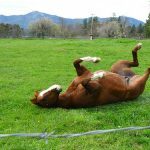 Many horses, without this comprehensive assessment and treatment, will suffer from nebulous issues that shift legs and change timing for months on end, frustrating their owners and keeping the horse in pain. When this type of history is present in a case, the horse might be in need of a more comprehensive evaluation. If you would like to discuss or schedule this evaluation for your horse, please contact Marie Bartling here at MVS 303-279-4893.